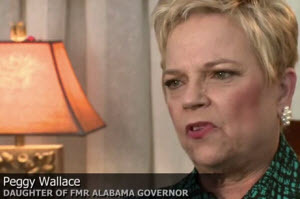 One of the United States’s many official media outlets, Voice of America published a video of Peggy Wallace, the daughter of the racist former Governor of Alabama George Wallace, says she is on a mission to promote “racial tolerance”. The word “tolerance” is probably not the best word to use when referring to Black people. Its like saying white people should tolerate Black people as you would a pest so we can all “just get along”. The video was published as content made specifically for Black History month. Voice of America (VOA) is the official external broadcast institution of the United States federal government. run by the Broadcasting Board of Governors. May white Jesus bless you for softening your heart enough to tolerate me Ms. Wallace. You know, it’s posts like this one that makes people get so frustrated and not want to care anymore to help promote racial tolerance. We feel like no matter what happens, no matter what we do, it’s never going to be enough, it’s never going to be right. Black people complain and fight for equality and to stop having the color of their skin be some sort of divide or deciding factor in jobs, education, etc. (and they have had to do this for many right reasons because there has been intolerance). But when you have a person, Peggy Wallace, trying to change the wrong her father has done and works closely with many civil rights leaders, and you make the negative statement of, “The word ‘tolerance’ is probably not the best word to use when referring to Black people. Its like saying white people should tolerate Black people as you would a pest so we can all ‘just get along’.”, then you wonder why people become frustrated with the black movement. “Racial Tolerance” is an accepted and common term, even used by Australia in their “Racial and Religious Tolerance Act 2001”. I also feel like you insult Rodney King and what he went through by mocking his statement by adding the part of, “we can all ‘just get along'” to your berating of Peggy Wallace’s sincere attempts. Black people constantly capitalize on the crutch of “white people kept black people as slaves, now you owe us!” as an excuse to continue to claim victim-hood and to justify every wrong they do either as individuals or as a group. Even though the percent of whites that actually owned slaves was small and that the very first true slave owner was a black man named Anthony Johnson, and the slaves that were sold from Africa were caught and sold by rival tribes (other blacks), somehow blacks think ALL whites owe you and that some sort of reckoning is still in order. This sense of entitlement still goes on strong, despite the fact that on February 24, 2007, the Virginia General Assembly passed House Joint Resolution Number 728 acknowledging “with profound regret the involuntary servitude of Africans and the exploitation of Native Americans, and call for reconciliation among all Virginians.” Or that on July 30, 2008, the United States House of Representatives passed a resolution apologizing for American slavery and subsequent discriminatory laws and the U.S. Senate unanimously passed a similar resolution on June 18, 2009, apologizing for the “fundamental injustice, cruelty, brutality, and inhumanity of slavery”. Peggy Wallace is actually closely related to a person who was staunchly entrenched in segregation and she is doing exactly what you all demand all the time. She is trying to make it right. She is finally one of the few whites that you can actually say her family did something negative against blacks, whereas the rest of us had no connections whatsoever. So you all have your apologies and official recognition. Now, any further BS I hear about this overzealous sense of entitlement only works to push away myself and others who were originally strong advocates for complete equality. We have grown apathetic towards your self-inflicted wounds and will no longer assist your exploitation of what started out as a very valid and important issue.